Oh dear. I said in my last post that I had more Laurels planned, but even I'm surprised that I started on my next one almost immediately. 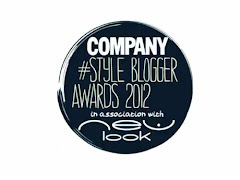 I think there may be at least another three Laurels in my head. 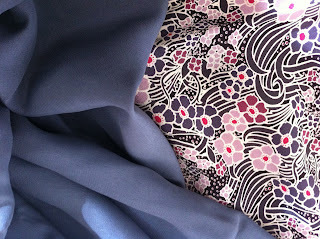 I'd quite like to make a few from light-weight cottons as, as much as I'd like my life to be one that accommodates wearing silk at all times, the reality is that cotton would be a more practical option much of the time. The silk has been sandblasted, which gives it a finish that has a semi-matt lustre, a manageable hand and a slightly faded look to the colour - I love it. 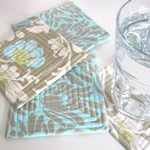 It's the most wonderful fabric, but not without a few problems. Firstly, it will expose the slightest mark, so I'll probably wear it when we're going out for drinks, rather than dinner (which may cause images of Paddington with marmalade on his paws to spring to mind, but it would be precisely when wearing a top like this that a stray olive would choose to hurl itself at me and roll down my top). 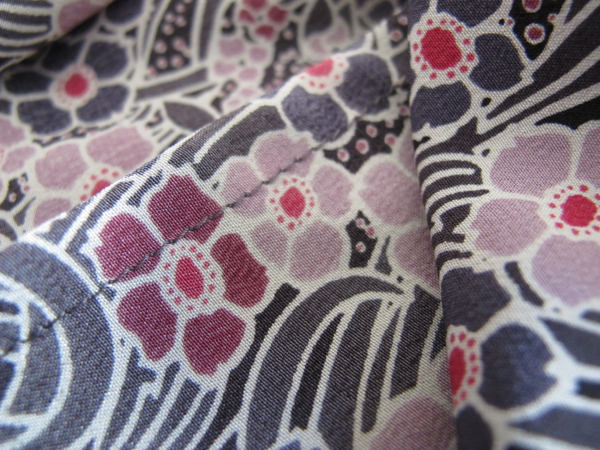 The sandblasted silk sews beautifully on the machine where its own weight is supported on the bed of the machine, but it's less forgiving when hand-sewing and when I hemmed it by hand I found I had to be incredibly careful not to cause tiny runs to form in the fabric by pulling on the thread with too much force. It is so lovely to finally have a go-to pattern that I know is going to just work in every way and fit reliably well each time I make it. I have some Nani Iro that I've been so reticent to cut into, but I'm now pondering a Laurel dress. It's Friday, the weekend is almost here and we have cake in the house to celebrate my father's retirement later today (his retirement has been on the verge of happening for several years but he has always agreed to stay on a little longer at the last minute. I feel quite disbelieving that he isn't just announcing a retirement to have a quick pitstop for cakes, before picking up his briefcase and heading back off to the City again). I will not be wearing either of my Laurels because of the Paddington/marmalade problem. Cake eating is just such a time when a Laurel in voile or cotton would be perfect. Following my last post about the construction details and the adjustments I made to the pattern, here are some photos of my finished Laurel blouse. It's already my favourite item of self-made clothing. It's rare for me to want to wear something I've made straight away. Often it will hang from my picture rail for a few days first so that it has time to settle in my mind and I can come back and look at it more objectively and try to gain some peace of mind that it doesn't look too overtly like I've made it myself (in a bad way, at least). 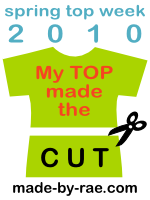 Happily, I haven't felt that this top needs any settling time. The only thing currently stopping it from breaking out of my wardrobe is that I love it so much that I want to save it for when I'm going somewhere special - there's every chance this will be soon, for a weekend with my sister. (I've been tempted to make her one too, but the last time we worth matching outfits was when I was 6 and she was 9, after our mother bought us matching miniskirts and jumpers to wear on the plane journey as we emigrated to Australia for a few years. It may be a treat reserved for when one's leaving the country with the knowledge that you have no chance of future contact with anyone who has witnessed your matchiness. Or just for when you're 6 and 9). 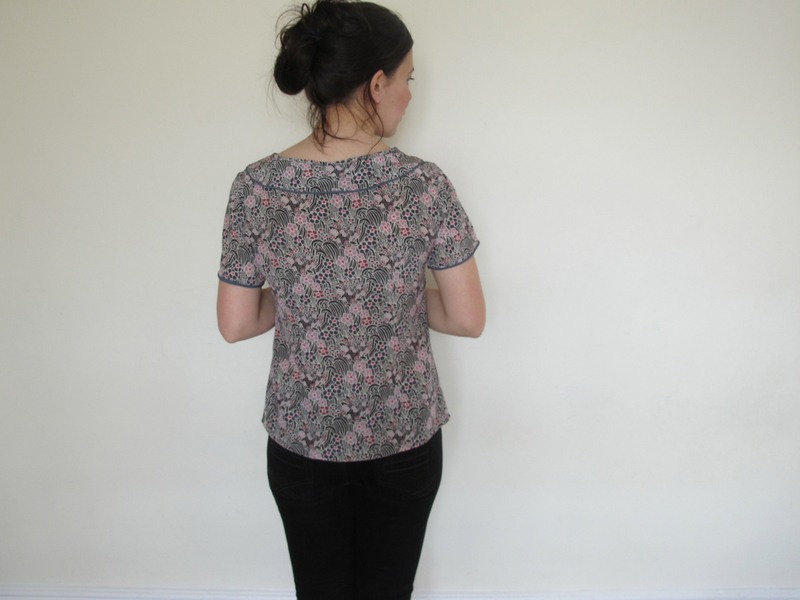 The blouse is really quite loose-fitting, but the pattern's cleverly placed diamond-shaped double-point darts at the back mean that it follows the curve of your back, giving a fit that's loose, yet tailored. 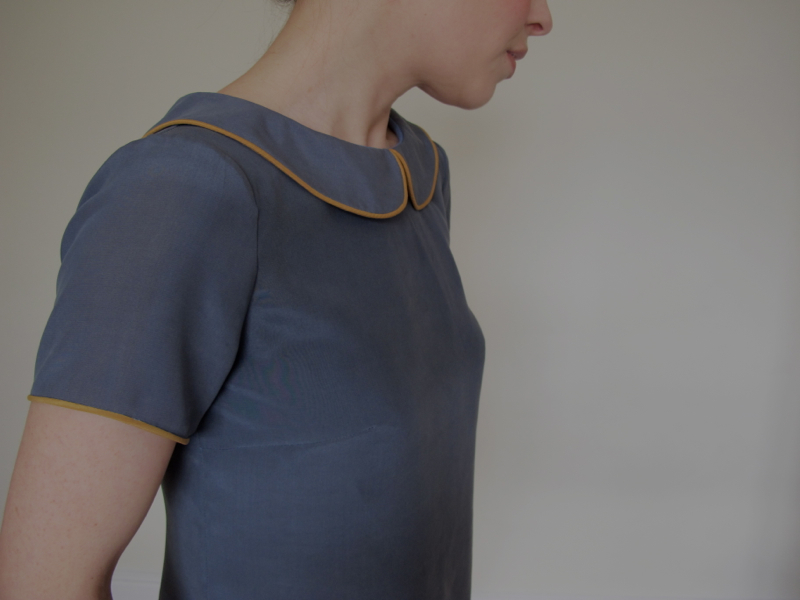 I used double-pointed darts to try and rectify a dress I was making that didn't look quite right last winter and while the dress never came to anything, I realised then that they're an amazing way of stopping something from being shapeless when viewed from the side. 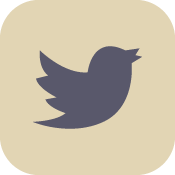 I may want to add them to everything now. The silks I used while making this (a Liberty print crepe de chine and a sand-blasted silk that happened to be an identical colour to one of the flowers in the printed fabric) were slippery, but thankfully not too prone to fray, which meant that I could actually enjoy making the piping for the collar and the narrow binding for the sleeves. 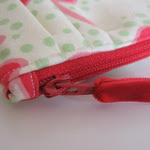 Inside it's finished throughout with french seams. Grainline Studio has written a fantastic tutorial which will give anyone new to these all-enclosing seams the confidence to try one not only on a straight seam, but an armhole too, called 'French all your Seams' (I love that title!) 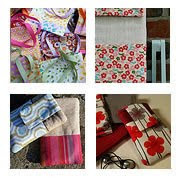 which is well worth having a look at if you're working with a fine, light-weight fabric. I contemplated overlocking this blouse as it's so much quicker, but the idea seemed slightly obscene when I considered how much I adore this fabric. 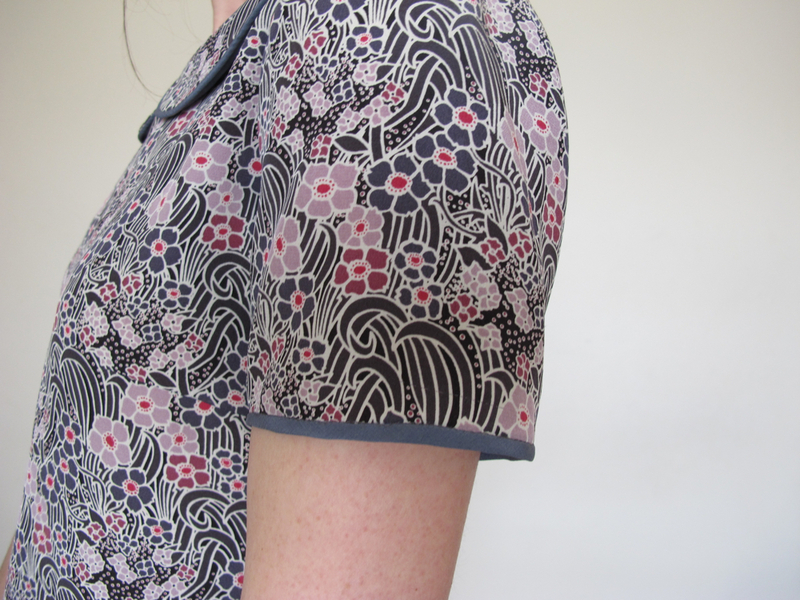 What I love about tiny Liberty prints is that they morph into something different when viewed from a distance - what looks like quite intense colours and a busy pattern when viewed at close range, tone down to something easily wearable the moment you're a yard away from them, and a pattern repeat that wasn't previously observable suddenly emerges (I noticed the same thing with this top which I made a few years ago). 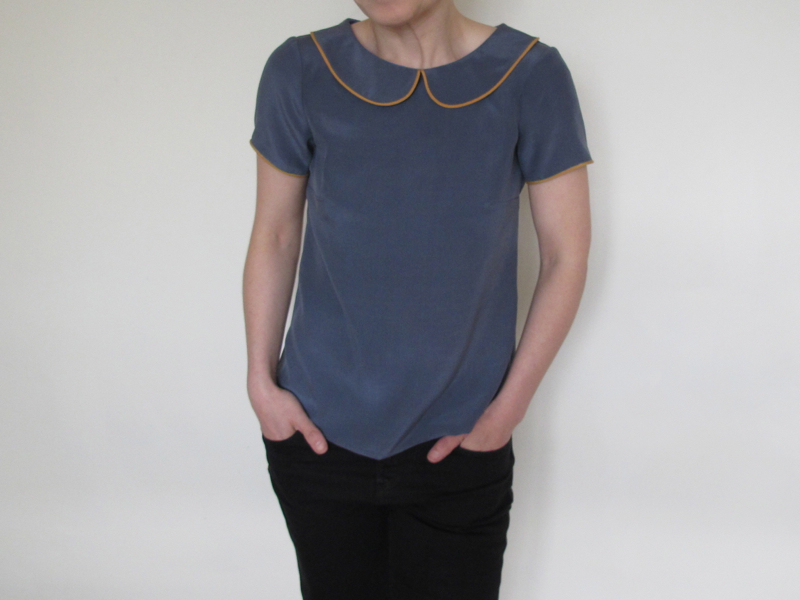 I'm entering this top into the Colette Patterns Laurel sewing contest. 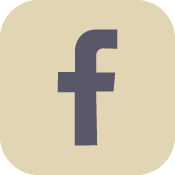 Have you made your own Laurel entry? I can't recommend trying this pattern highly enough - it's such a lovely blank canvas for showing off a special fabric or adding in your own details. Obviously, because I love this pattern so much, I have several more already planned in my head and hopefully soon to be made. I think this may be my summer of Laurel. 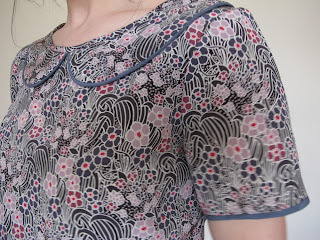 At the end of last week I found some time for some dressmaking, having suddenly been inspired by the warmer weather. 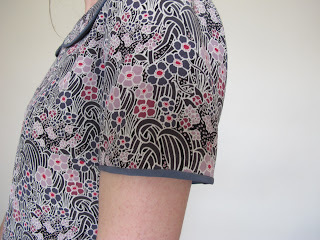 While I've always loved Colette Patterns for skirts and trousers, I've been wary of using their patterns on my top half as their smallest bust measurement is nearly 2" bigger than my own. I've either tended to draft my own patterns or use those from Japanese pattern books where they're cut for a smaller frame. However, I've now realised that I've been depriving myself from a huge amount of fun as making a SBA (small bust adjustment) to the pattern was actually a very simple process. I referred to The Complete Photo Guide to Perfect Fitting and made my adjustment to the paper pattern out the outset. 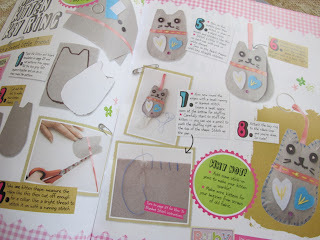 If you don't have this book (which, having now use it, I can say is brilliant), then I'm told by Kerry that this tutorial by Megan Nielsen is excellent too and it looks very similar to the one in my book. My main concern in changing the pattern was that my small bust measurement comes from having a very small ribcage rather than a barely-there bust so I was unsure if an SBA would work in the way I hoped. But my worries were unfounded as the newly drafted darts give a perfect fit. 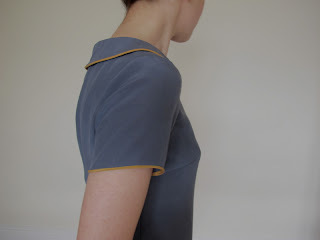 Nina commented that she was in the midst of making a Laurel herself and found that there was a lot of ease at the back of the sleeve head - I found exactly the same, although happily this was fairly easily rectified by shaving half an inch from the pattern in this area. If this all sounds like a lot of changes and fitting issues, it's actually not at all and I'm so delighted with the finished top that spending twenty minutes altering the pattern seems irrelevant. 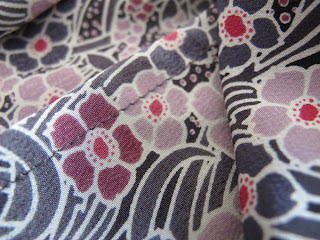 It is a beautifully cut pattern and once I was happy with my toile, I knew that it was going to be worth risking cutting into two of my most treasured fabrics which I've had stashed away for a year now: a beautiful silk crepe de chine Liberty print and a plain, sand-washed steely blue silk. I drafted a Peter Pan collar to go on my Laurel top and you can see it above before it's sewn into place. 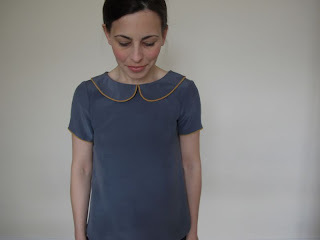 I think that covers my construction issues, so tomorrow I'll hopefully show you the finished garment - I'm already planning my next Laurel as I love this pattern so much. I'm also contemplating a Violet blouse. Every time I use a Colette Pattern I'm reminded anew of just how good they are. 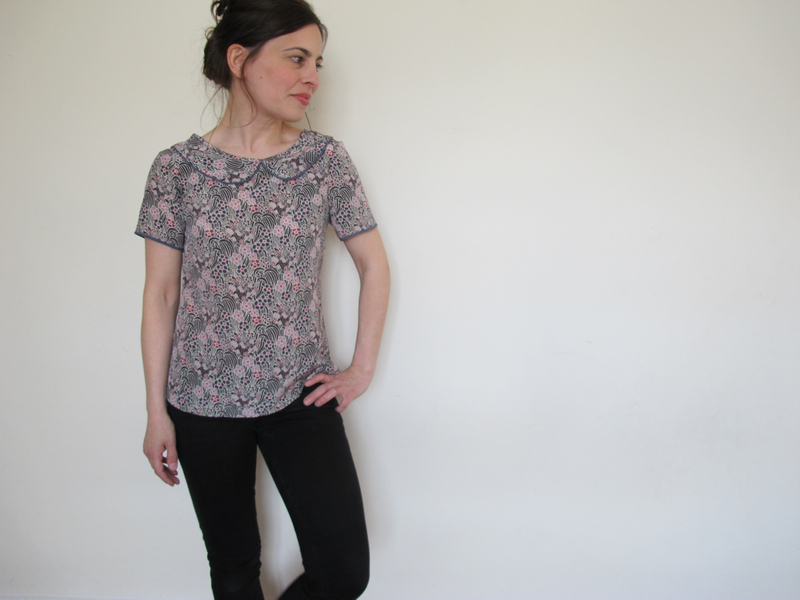 Have you been tempted into some dressmaking now that Spring has almost sprung from the gloomy dark box its been hiding itself in? 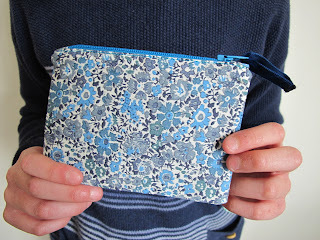 Regular readers will know that I have something of a bias for using Liberty prints when sewing, so I'm delighted to have been asked to write a guest post tutorial for the Liberty Craft blog. I designed a summery bag for carrying groceries (or if the English summer arrives this year, supplies to and from the park) - it's cavernous, but isn't over-sized and the handles can be set to be just the right length to wear the bag both on your shoulder or to carry it in your hand. 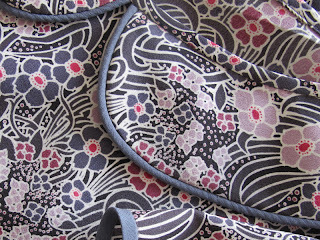 I chose my fabrics from Liberty's new Stile collection of quilting-weight cottons - I am utterly in love with this elegant, deeply saturated blue print (and it's the same colour as my very favourite cardigan). 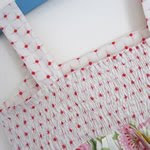 The upper portion of the bag lining is cut as a separate section so that you can use the same print as that of the outer fabric, so there's no visible peeky-over fabric bit from a contrasting lining. And the outer pocket is piped with more Stile print goodness. And there's a boxy bottom. Because that always seems like a good and practical thing. 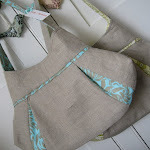 You can find a bit about me, as well as my bag tutorial, here. 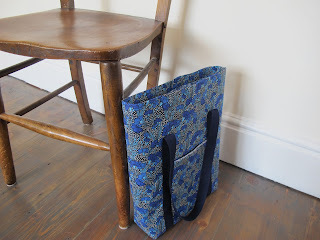 And if a summer bag doesn't appeal today, then do go and look through the archives as there's some wonderful tutorials from other bloggers to be found there. I haven't been around quite as much recently due to the Easter break, but my sewing machine hasn't been entirely neglected. My daughter and I had a day to ourselves and she decided she'd like to sew. 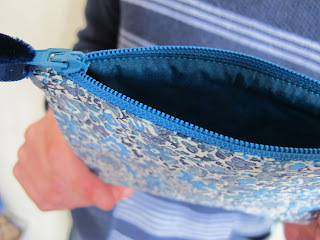 She chose some Liberty Tana lawn and I showed her how to insert a zip. She did everything from cutting the fabrics with the rotary cutter (eep! 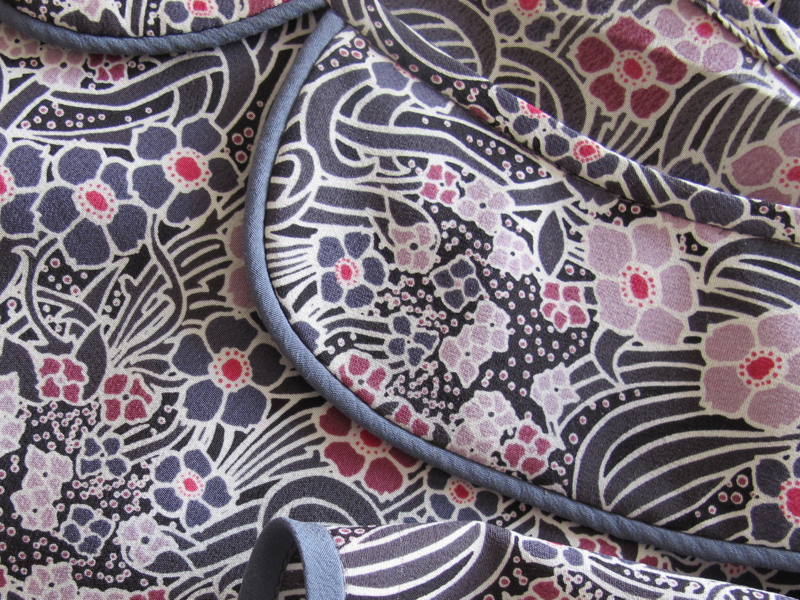 ), ironing on the interfacing (double eep!) and sewing the zip in place...the only thing I refused to let her do was use a match to singe the end of the velvet ribbon zip pull. Not because of any incompetence on her part, but more because of my own inability to deal with a potential fire near her (if you follow me on Instagram then you'll know that I had 'an incident' recently where my handmade Liberty oven gloves caught fire and I suffered a total memory blank as to how useful water can be in such a situation). She took such care over every detail. 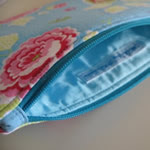 When I looked at her little zipper purse afterward I realised that there was no part of the machining that I thought I could have done better myself - such a lovely feeling. She seemed to really enjoy the process: the aha! moment (not of the Morten Harket variety) when you discover that the counter-intuitive order that the lining and outer fabrics are placed in when you're inserting the zip really does work; seeing how the different sewing machine feet helped her to do the things she wanted; the satisfaction of seeing the lining sewn neatly in place so that it can never be caught in the zip. 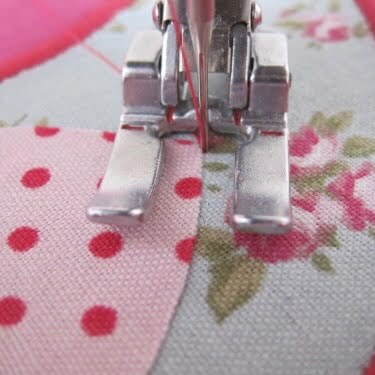 Her innate neatness and perfectionism seem so well-suited to sewing. We also had a day to ourselves in London. 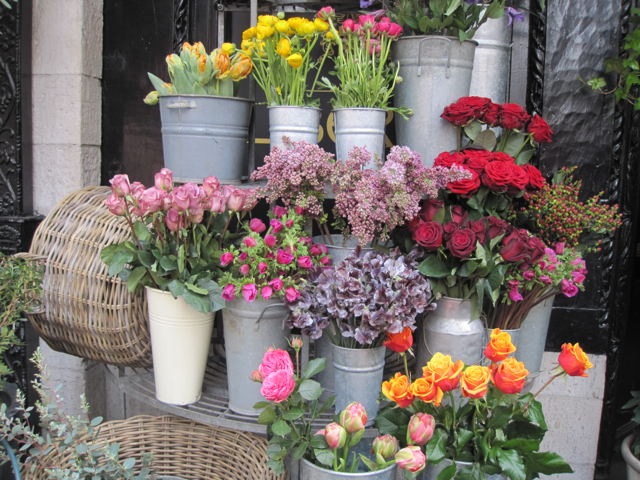 I took her to Liberty - she fell in love with every part of it and wanted to stay so long that we had to briefly go and revive her aching back in Le Pain Quotidien with a pastry before she could return to complete her third tour of the stationary department. 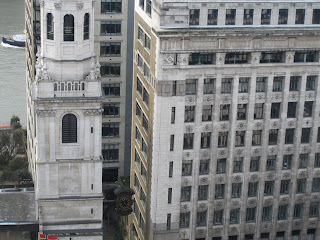 We also went up The Monument which marks the Great Fire of London. 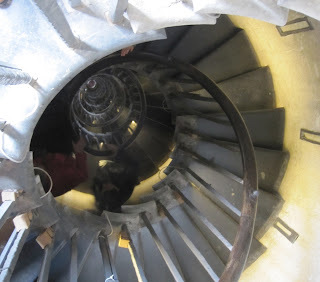 The top was 311 steps up a spiral staircase. As everyone else (including toddlers and the elderly) happily raced up and down, I seemed paralysed by vertigo and was nearly violently ill. But at the top there were amazing views and even buildings that seemed to show quilt patterns within their walls. During the holidays we were also sent a review copy of Ruby Loves, a craft magazine aimed at 8 - 12 year olds. 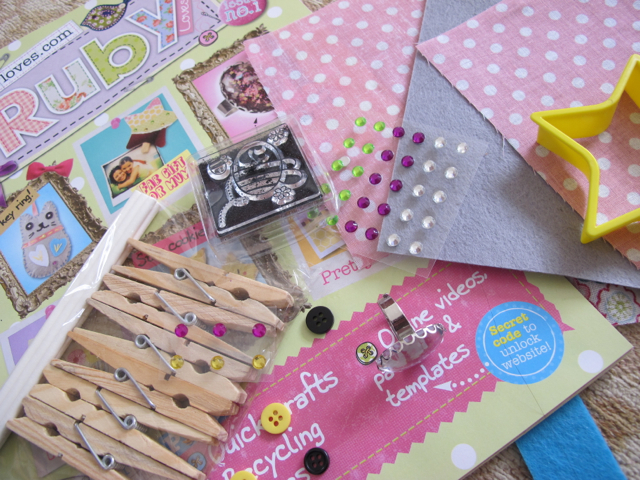 It contains a mixture of baking, paper craft and sewing. It's the perfect thing for a rainy afternoon, especially if (unlike us) you don't have cupboards already bulging with craft supplies, as nearly everything you'll need is included, from pastry cutters to buttons and fabric. Our verdict was that we both thought it was a really lovely magazine, but that it would appeal to a slightly younger girl (my daughter is 11) . 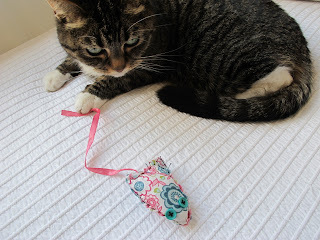 However, when I was out with my son one afternoon I came back to find that she'd used some of the fabric and ribbons included with the magazine for her own purposes: hand sewing a toy mouse for Honey. 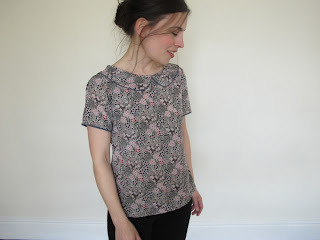 The holidays are now over and the slight rise in temperature has turned my thoughts to dressmaking. 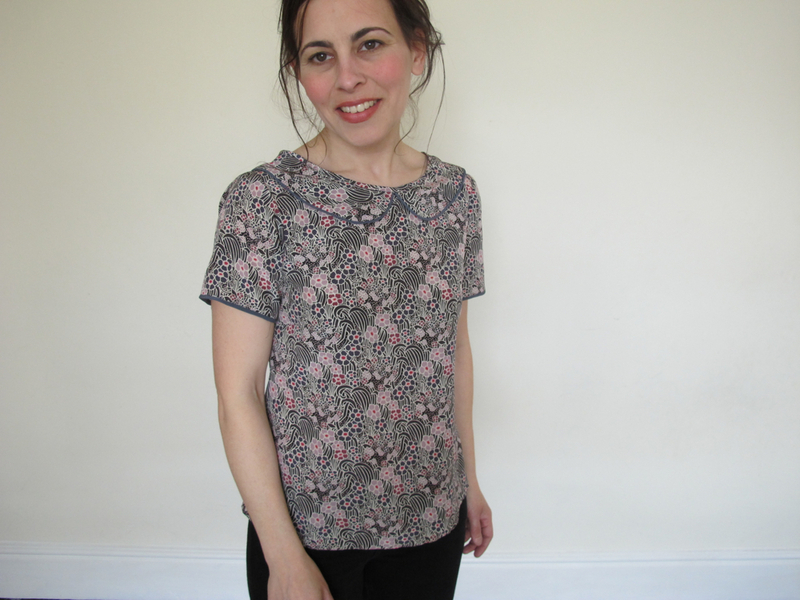 I've bought the Colette Laurel pattern from Backstitch and am looking forward to eventually wearing something that isn't woollen or made of heat-tech fabric. It may require a few more degrees of warmth to enable that though. I have a few book reviews for you today. When Cico Books offered me a review copy of 'Hand Quilted with Love ' I was delighted as I've loved all of Sarah Fielke's other books. Contrary to what the title suggests, it's a book about quilts that happen to be hand quilted, rather than a book about hand quilting. 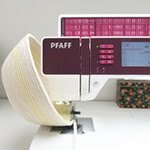 The book hops about all over the place to include a real mixture of quilting techniques - everything from hand appliqué and hand piecing to simple and more complex machine piecing. 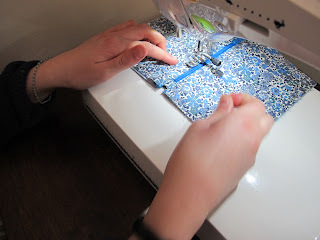 It means that there's likely to be something for everyone and inspires you to begin to stretch out into areas of quilting you might not have tried before (for me, that's hand appliqué). 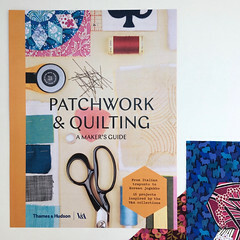 What I really love about this book is that, while it does offer a guide as to how difficult a pattern may be, it doesn't prescribe a skill level for completing the quilt, but encourages new quilters to have a go in a way that's warm, friendly and encouraging. 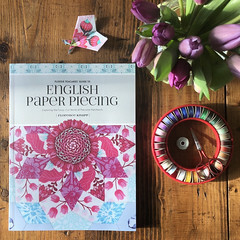 My own experience of learning to sew was that I wanted to jump in and try whatever appealed most, irrespective of how difficult that thing may be - if you're new to quilting then you will almost certainly find this an encouraging book, which makes trickier things feel within your reach. 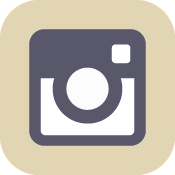 To this end, the techniques section is excellent - it's concise, but covers all the things you may need to know as a beginner to a particular technique (and possibly offers some new tips even to an old-hand). 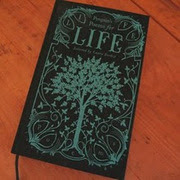 The colours and photography are beautiful - it's a light, airy book that's cosy to look through. I have quite sober taste when it comes to fabrics, perhaps because of the gloomy English light, so the fabrics in Willyne Hammerstein's 'Millefiori Quilts' are closer to those that I'd naturally be drawn to (Willyne is dutch, although the book is published by Quilt Mania, so it's written in French with an English translation on each page). I realised when I posted a photo of one of the quilts from this book on Instagram that it was a treasure that others may not have come across. I bought my copy at the Festival of Quilts last summer. It is a stunning book that has frequently turned my brain inside out while trying to comprehend the cleverness of the designs. 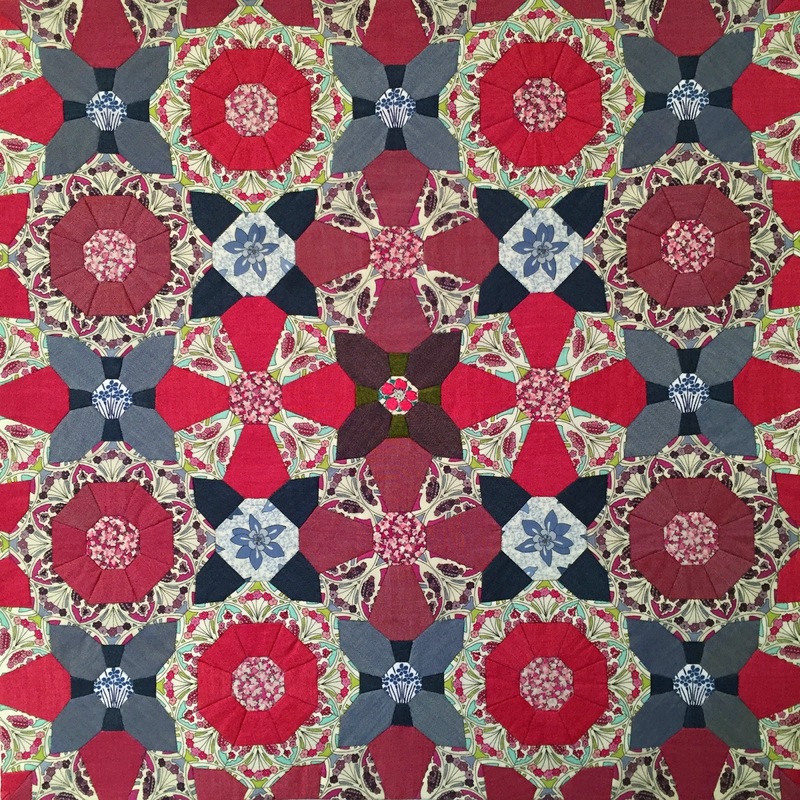 This blue and red beauty called 'Wild is the Wind' meanders around in a pattern that at first looks simple until you study it close up and realise that there is an unclear logic to the way the blue piecing flows around the quilt. 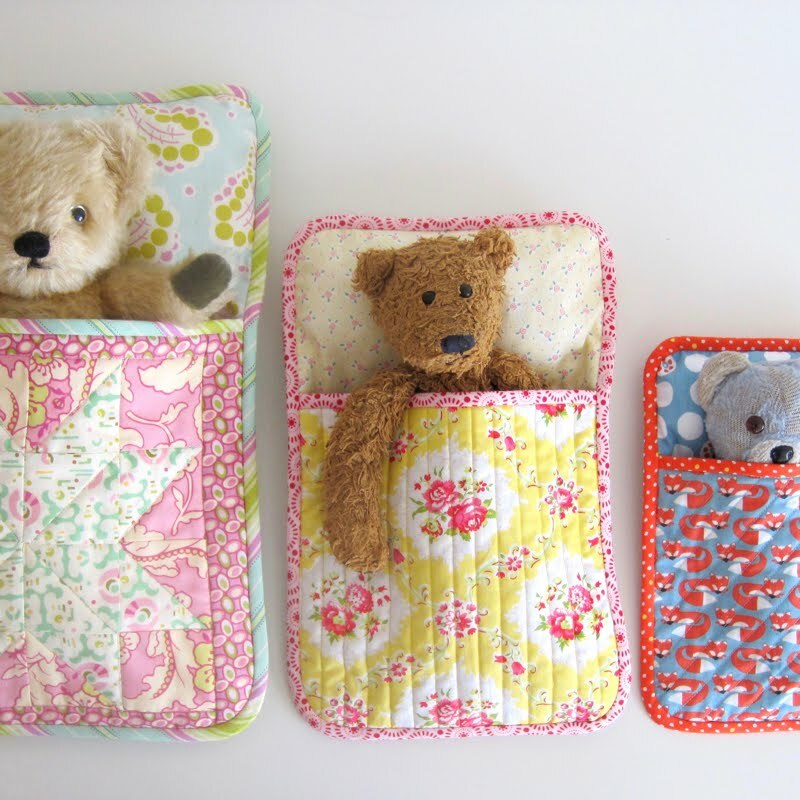 I love quilts that have a sense of symmetry, but Willyne really plays with this. 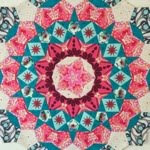 She will often fussy cut fabrics to create an intensely kaleidoscopic feeling of symmetry within a small area, but then place those pieced designs with no symmetry at all within the bigger picture of the whole quilt. 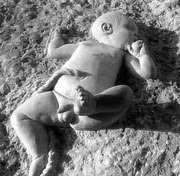 Study the photos below and you'll get a sense of what I mean by this. I frequently study these designs and wonder at whether Willyne plans out the quilts in full before she begins or if they are pieced as she goes. I normally comfort myself, as I'm returning the book to the shelf, that it must be the latter as if it's the former then her skillfulness is entirely beyond the realms of my comprehension and imagination. Either way, I'm now tempted to give some more improvised piecing a go to see what the results are. I adore the layout of this book too. 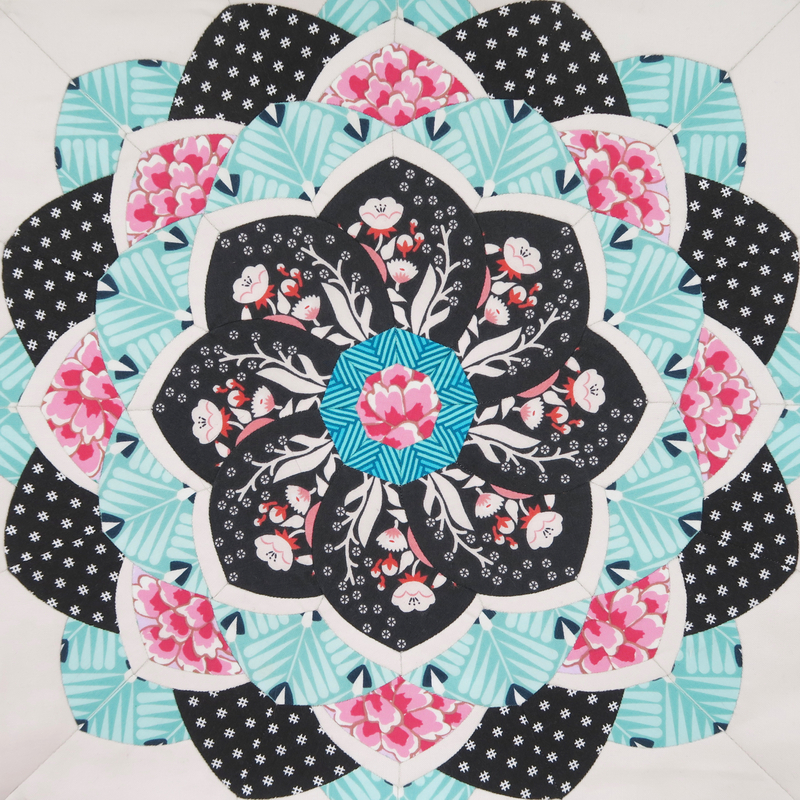 It's another beauty from Quilt Mania. I hadn't heard of Willyne Hammerstein before buying this book, but she's quickly become one of my quilting heroines. Doesn't this look like a wonderful sewing room? I love how many different projects there look to be going on in it. My own hand-piecing is coming on slowly as the Easter break unfolds and comes into its last few days. I'll hopefully show you my progress in my next post. 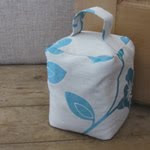 This week I picked up some hand-sewing again as it's a sociable activity while my children are on their Easter holidays. I've had this project in my head for nearly a year now, but after my English paper piecing marathon before Christmas I decided to rest my eyes and elbow (for some reason hand-sewing makes my elbow ache horribly) before embarking on a new project. This time I haven't used the English paper piecing method to piece this together. 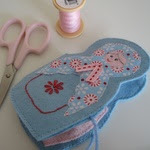 Everyone finds what feels right to them with a density of stitches and, for me, the whip stitch I naturally settle in to using for EPP works out at around 22 stitches per inch, which makes it quite labour intensive. I've tried to lessen this, but I just gradually revert back to what instinctively feels right. To piece these I've abandoned papers and am simply piecing them using a running stitch of around 12 or 13 stitches per inch...which means that not only is it much quicker, but a running stitch is also easier on my weirdy painful elbow as I don't have to pull through the thread with each stitch, but can gather four or five stitches onto the needle at a time. It almost feels like cheating, it's so quick by comparison. 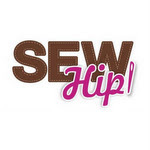 I have been the lucky recipient of helpful tricks and tips from Cathy via email and Lorena on Instagram and it's made my transition to hand-stitching with a running stitch almost completely painless. Something (I can't actually remember what) sparked off the idea for this tiny - as yet, unfinished - piece when I went to the Quilting show at Birmingham NEC last summer. 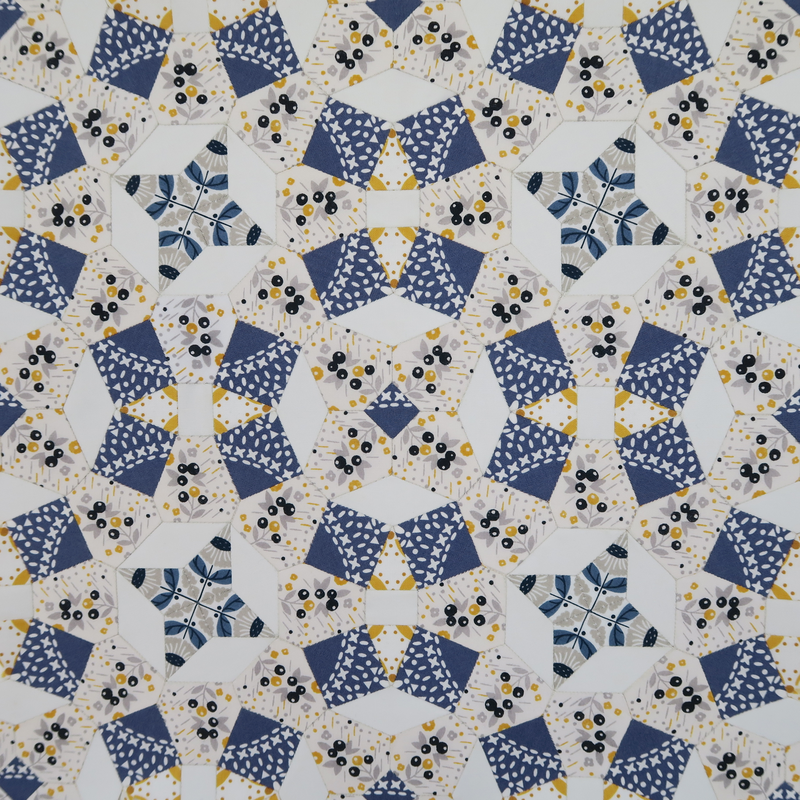 It will hopefully end up framed and hanging in our dining room and my focus is to fussy cut (even though I loathe that expression) specific patterns from the fabrics that ,once placed in a circle of diamonds, create new repeating patterns. The piecing gives a finished diamond size of 1". 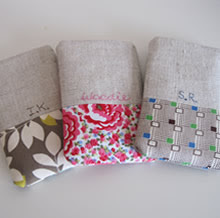 I bought the fabrics right there and then, mostly from, I think, Petra Prins' stand. The fabrics have tiny prints and I enjoyed choosing some that incorporated a stripe, knowing that I'd enjoy matching the lines up, as you can see in the top left star in the photo below. 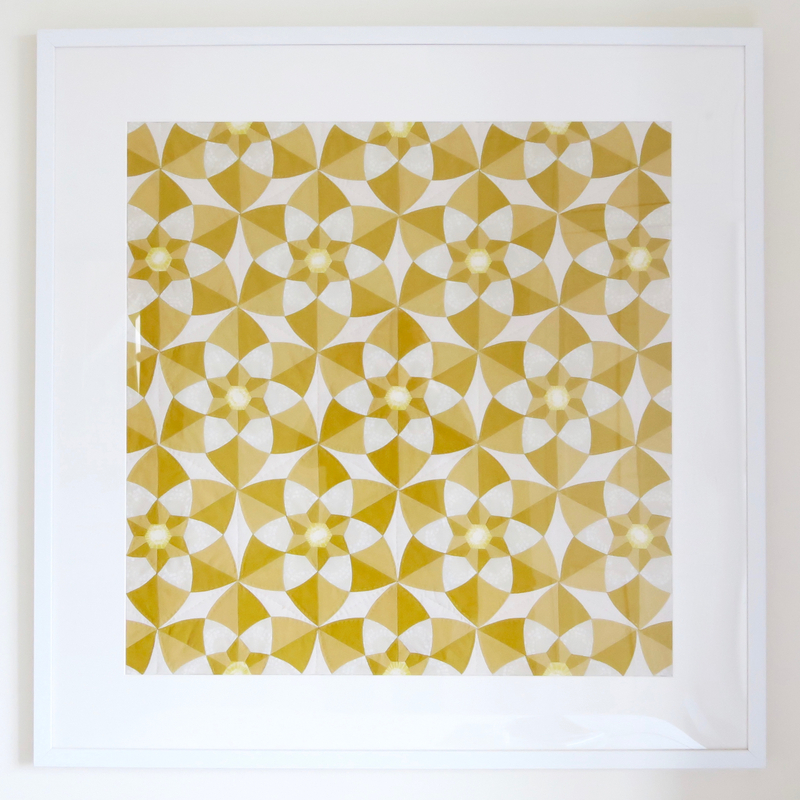 I worry that these prints may look a little old-fashioned and stuffy...that they may even appall you slightly, but I find myself strangely drawn to them and I love the new rings of flowers that dance amongst the stars. 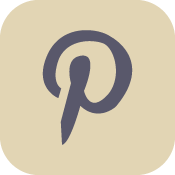 One of my early mistakes was to use Frixion heat-erasable pens for marking out the sewing lines on the fabrics. It stopped me from being able to press the seams with an iron (which I normally do obsessively at every opportunity), until I eventually became so despairing that I decided to draw over them with a non-heat-erasable silver gel pen, as I couldn't bear the mass of wavy coral-like seams I was faced with on the underside. The silver gel pen works well and doesn't show through on even the palest of fabrics. Pressing each seam into the place I wanted it to lie at this point was more troublesome, but they are now all lying happily in their correct places and I'm ready to embark on the next round of piecing.